You will not find Jurgen Klopp apologising for many of the decisions he makes as Liverpool manager – that is just not the sort of individual he is. He will more often than not stick to his guns if he or a member of his squad comes under criticism, so you know that when he does say sorry and hold his hands up, he means it. Now that has all changed – and it is thanks to one of Henderson’s teammates on Merseyside. The English ace has been given a box-to-box role higher up the pitch which has seen him show off his creative ability as well as his extraordinary work ethic, scoring and assisting in the win against Southampton before setting up yet another in the victory versus Chelsea. However, he would not have been able to hit these new heights had another Liverpool ace not also lifted his game – 25-year-old midfielder Fabinho. The Brazilian looks like one of the best defensive enforcers in the Premier League right now and having filled Henderson’s place as that central shield to the defence, the England international has been given more freedom to move forward. As Klopp said, he had to play Henderson in that deeper role because no one else at Anfield could carry out the duty to such a high standard. 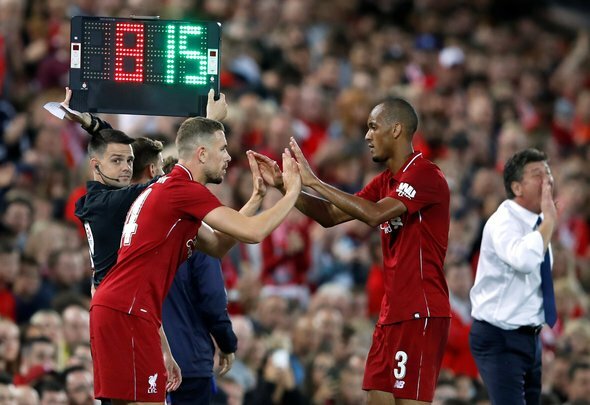 Now Fabinho is on the scene and dazzling the Liverpool faithful, his teammates are flourishing – not least the man whose position he took.